PSSSST… want to win an All Access Pass? There’s a giveaway going on right now! So I was looking back through all of my patterns the other day and realizing that, for whatever reason, I’ve never designed a regular, classic scarf. I’ve always done infinity scarves! It’s probably because I love to wear them; they are just so easy. 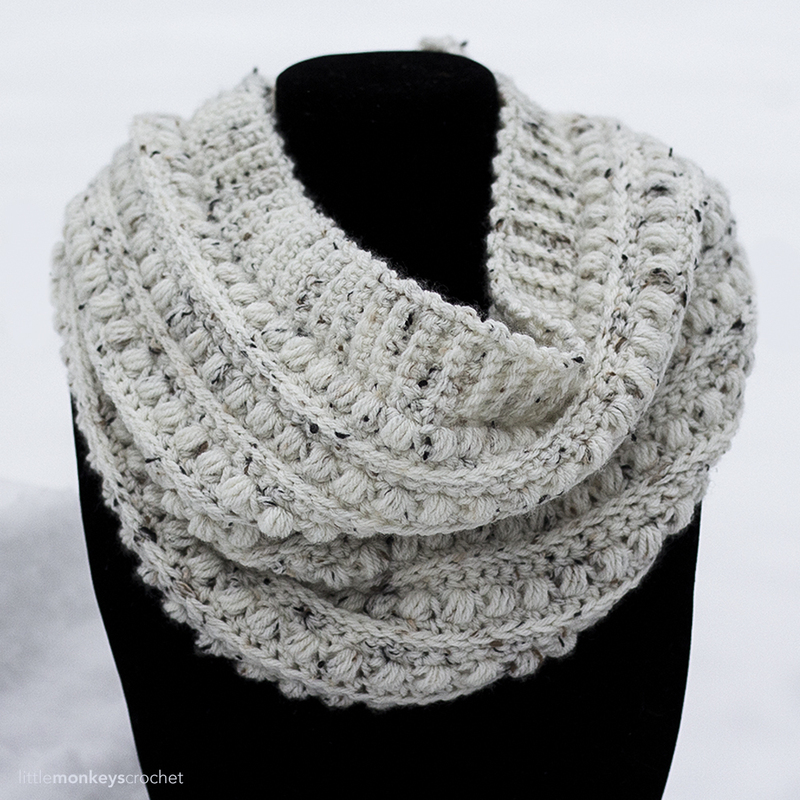 When I got the idea for this scarf, I originally intended it to be an infinity scarf, too. I was going to seam it up at the end, add some buttons, and maybe even add some fringe all the way around. But the longer I worked on it, the more I started to think, this should be a classic scarf. It has this amazing texture, and when I would double-wrap it around my neck, all that gorgeous texture just sort of got lost in the folds. But when I draped it once around my neck and let it hang, it just looked right. And since I loved the finished look of this scarf so much, I knew it needed to be a set. 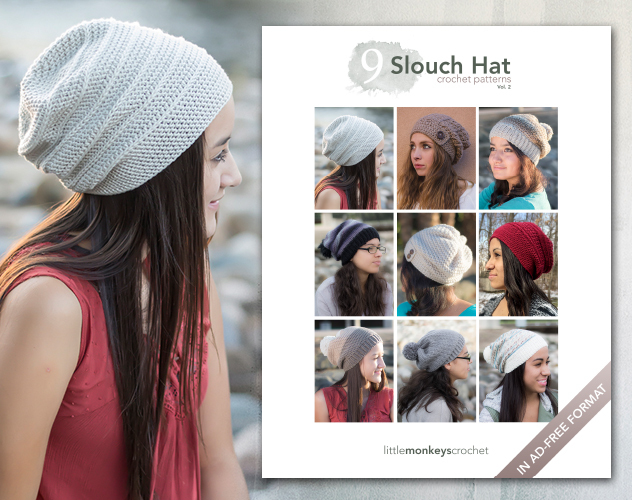 Click here to view the pattern for the matching slouch! Finished Size: 70" long (not including the fringe) x 7" wide. It's not "super-scarf" dimensions, but it's big enough to give you lots of stylish, wearable options. Yarn: Approximately 725 yards (this does include the fringe) of Cascade Yarns' Longwood Sport. Longwood Sport is a #3 light yarn, and the color shown on the sample is "Oatmeal." (2) Pattern is worked in rows, and the ribbing sections on the ends are worked after the main part of the scarf is finished. Next we'll crochet the small ribbing sections to each end of the scarf. We will crochet one row of SC along the short edge to provide a base for our ribbing, and then we will be working the ribbing in vertical rows, attaching it to the base row with SL STS as we go. 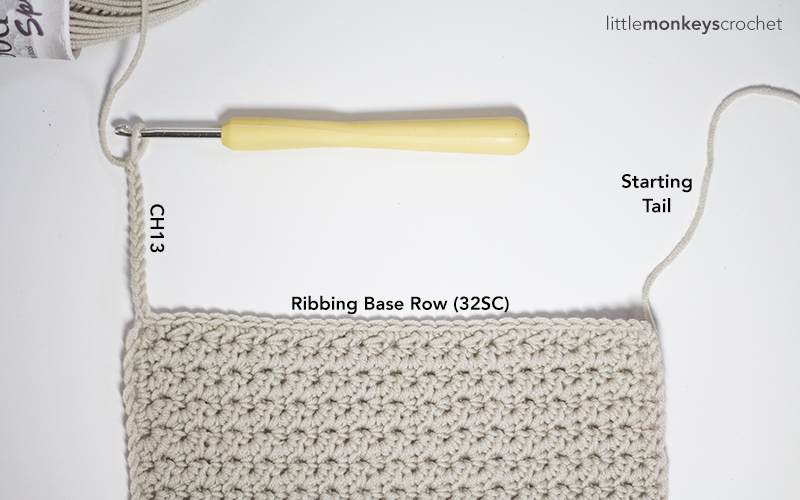 Ribbing Base Row: Attach yarn to one of the corners of the scarf. SC evenly down the short edge, putting 1SC in each row, for a total of 32SC. CH13. Repeat Rows 3-4 all the way down the Base Row (for 32 rows). Fasten off and weave in ends. Repeat "Ribbing" instructions for the opposite end of the scarf. 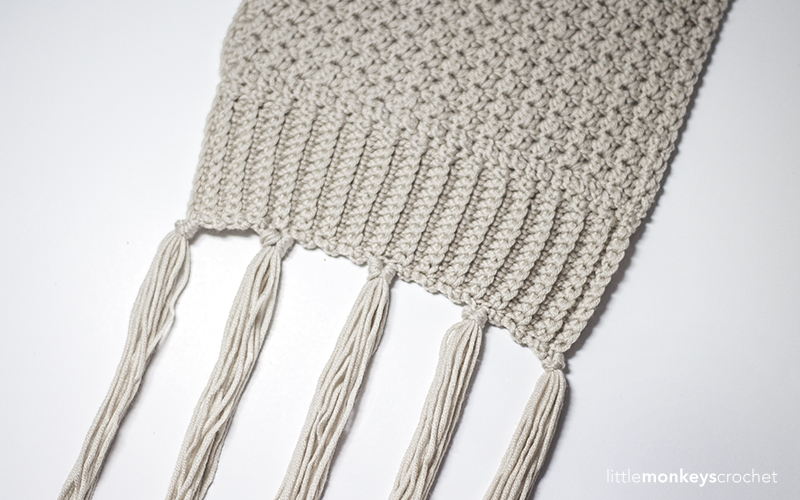 Last, we'll attach tassels to both ends of the scarf. Cut at least 80 (a few more to be safe) 18" strands of yarn. In groups of 8 strands, attach yarn to first edge of scarf; 5 groups total, spaced evenly across the edge of the ribbing. Repeat on opposite end of scarf. Love the hat and scarf set, thank you for the pattern. Wow! just stunning I so must make some. Love this scarf! 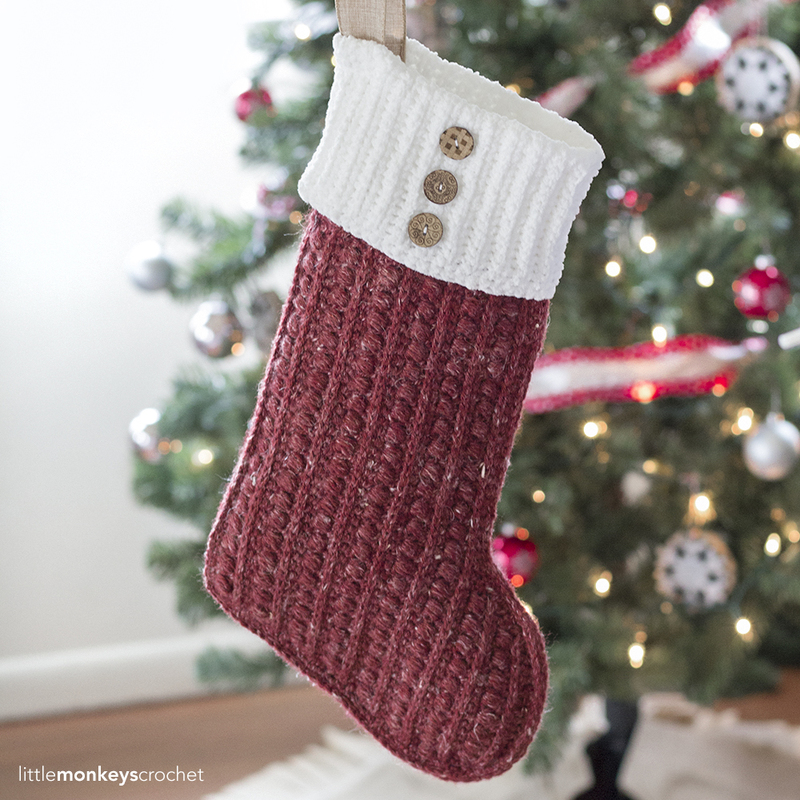 I am inspired to make one! Thank you for the pattern. I can’t wait to get started on this!!!! LOVE this pattern!!!! So. so pretty!!! Thanks for sharing your beautiful designs! 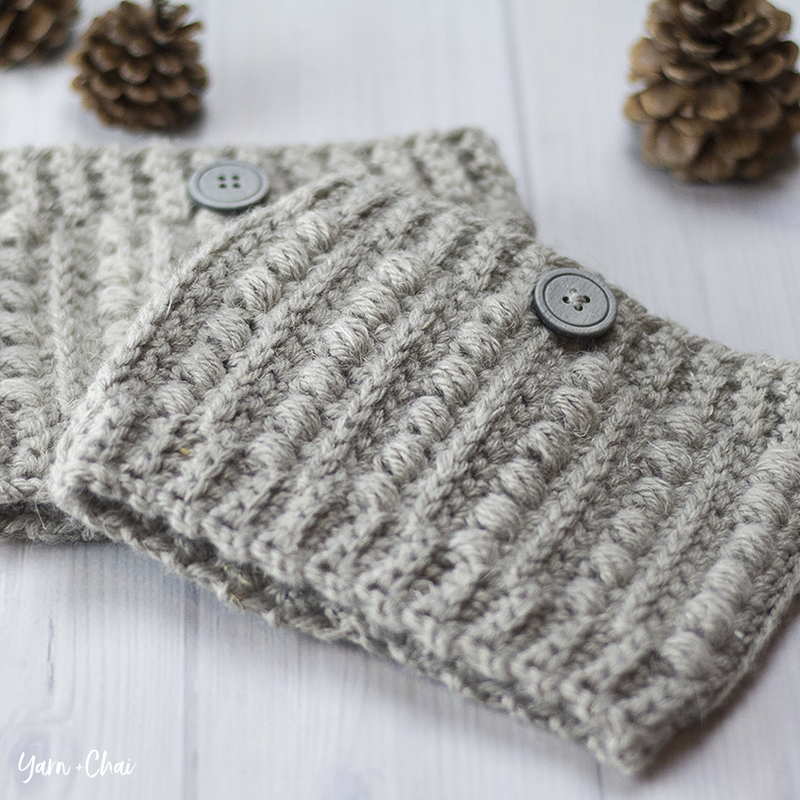 Love your elegant looking hat & scarf patterns, perfect for Christmas gifts. Love this! Definitely on my to-do list! This is the scarf pattern I have been looking for!! I have been searching everywhere for a classic, timeless, yet versatile scarf pattern, but I have yet to find “the one”. Thank you for creating this pattern! A cute scarf. Love you showing us the pictorials on how to add the ribbing. It makes it easy to use. I love this long scarf and its matching slouch. I will be busy over the next few weeks!! Thanks for such a beautiful pattern. Love this look – thanks for the offers!! Can’t wait to try this pattern, looks great! Thank you ? Love the pattern. I am at the ch 13 and just can’t figure out how to turn without crocheting on the wrong side. 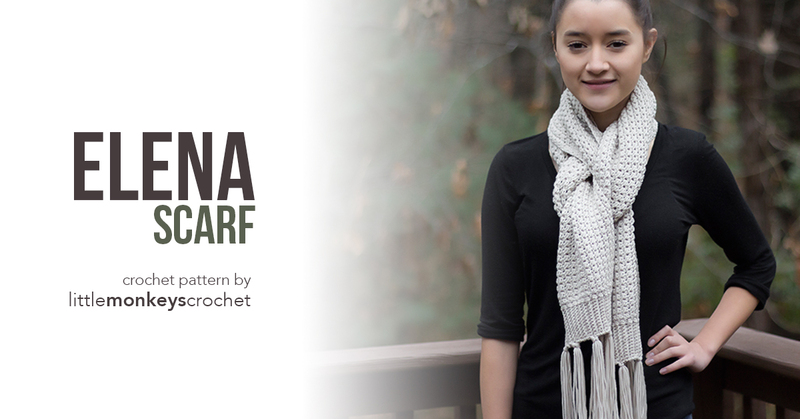 The scarf is beautiful without the ribbing and fringe. I like this scarf. I added to my Ravelry queue. Love this set – scarf and hat! Your patterns are beautiful!! Thank you for sharing them! Am I skipping a stitch between each SC+HDC? Yes, you repeat the entire sequence in the parentheses. if there’s 32 rows of ribbing and 32 rows for the body and it’s all worked lengthwise why not just add 26 (13 on either side) and make it all in one piece…? 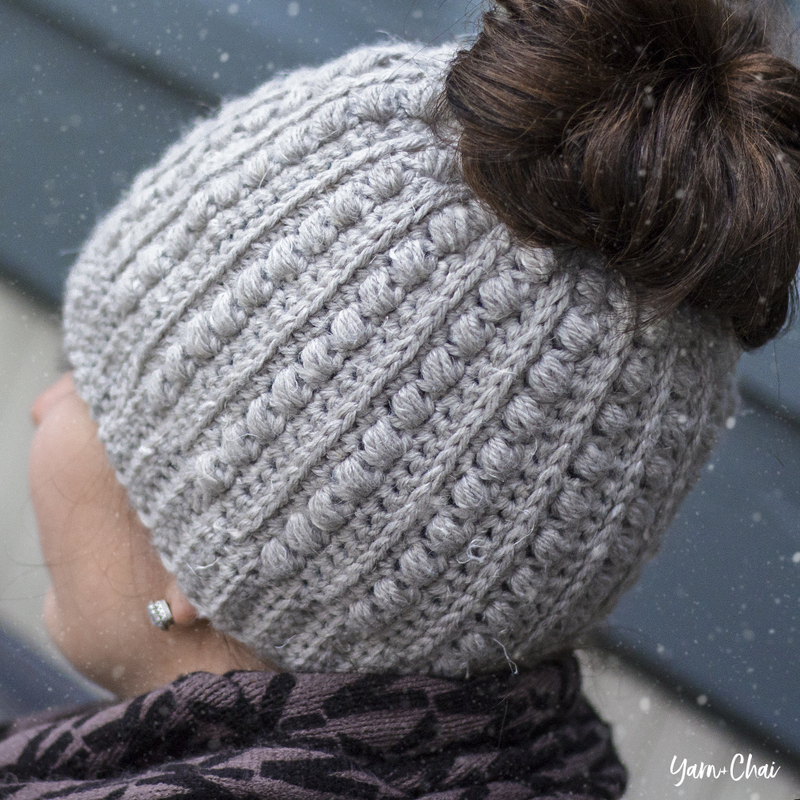 love your patterns:i’ve made several carlyle hats that are just amazing. Finally! A beautiful, timeless, traditional scarf (and a matching hat to boot!!!) that even the most conservative women will reach for over and over. Thank you so much! These will be my next projects! I don’t think people are necessarily “scared” to use dk/light/#3 yarn. Worsted is the most common weight yarn available especially from the store. Many people that have stashes of yarn usually have a ton of worsted. DK/light/#3 most often comes in “baby yarn” at most retailers. Unless your purchasing online, many people are limited in yarn weights.